Commercial real estate Leasing scripts. Lease scripts for Commercial real estate are written to help agents prospect for lease listings by telephone. Scripts for commercial a real estate lease will increase your "hit-rate" dramatically and get you more appointments. A commercial real estate lease script is designed to help you to successfully talk with a lease prospect. Just stand up the commercial real estate script for leasing in front of you & dial the phone. 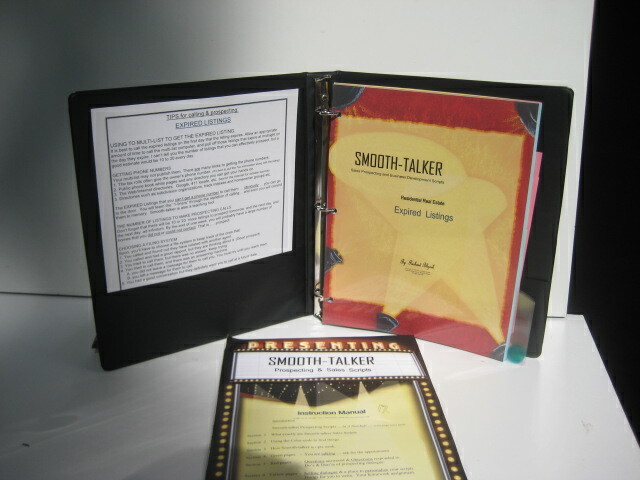 Smooth-talker commercial real estate lease scripts are a tangible product that you can use immediately. It's not something you must assemble or make yourself. You'll use it on every business call you make. Smooth-talker commercial real estate lease scripts include all of the things that you say "after" the initial introduction has taken place. 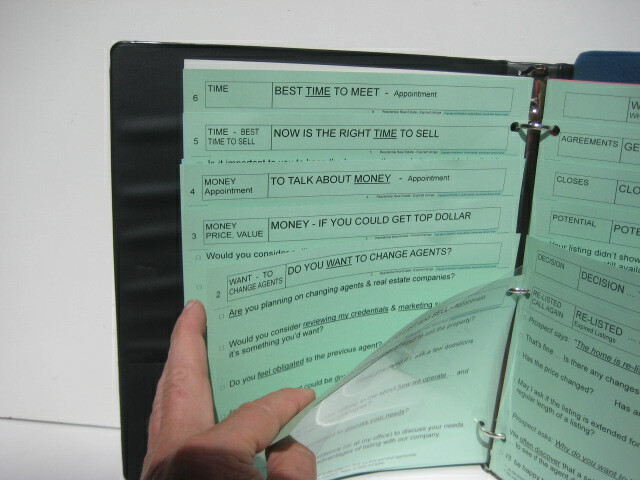 Scripts for leasing commercial real estate prospecting are ready to use right out of the box. 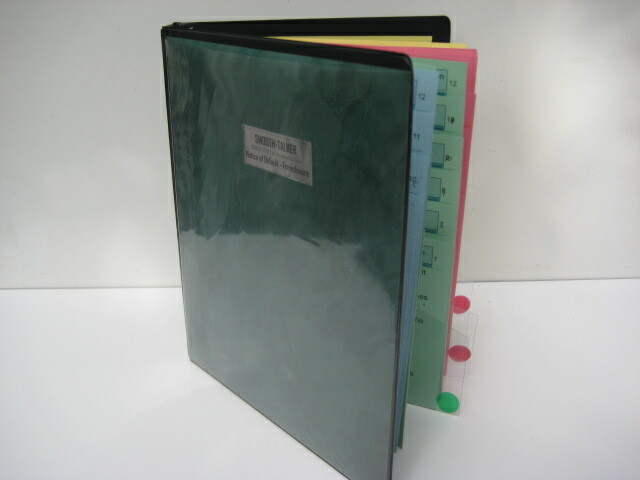 also a "Script writing" kit to write your own additional scripts. 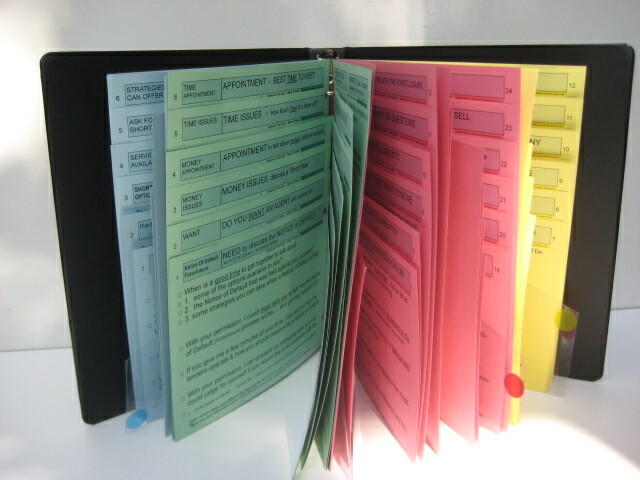 section flippers. Ask the prospect if they need or want the your services, request an appointment, talk about money etc. Respond to the questions & objections most often heard from owners of commercial property. Sell yourself and your company by having at your fingertips selling dialogue and a sales presentation. We're so sure that you'll be satisfied that we offer a "30 Day Money Back" guarantee! Should you spend the money? The acid test of determining whether to spend your money on call contact tools versus indirect advertising is to analyze the results to see if they are what you expect. How much business is derived from direct calling versus passive marketing methods? Passive methods includes mail, television, radio, newspaper, print magazine advertising, internet, all which are very expensive. The direct call method is by far the best & most effective. Competing with experienced realtors? A great equalizer is needed. Like the old saying "If everybody is somebody then nobody is anybody." The playing field was leveled when we developed Smooth-talker lease scripts. Commercial real estate lease agents must compete with experienced sales professionals, especially when they are new to the business. 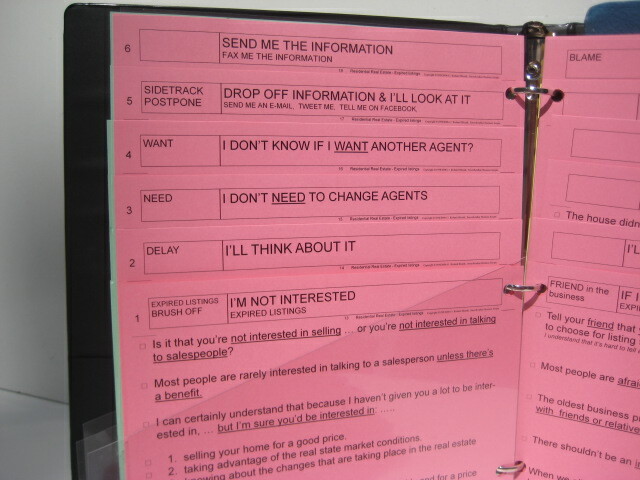 Color-coding makes it easy to find the dialogue when prospecting. Commercial real estate lease agents can find the proper dialogue with the help of Smooth-talkers' color-coded organization and structure. They want to have traditional objection responses because they they don't have much time to speak during a prospecting telephone call. Commercial real estate lease agents must prospect every day to be successful. The turn-over of tenants occurs because of changes in the marketplace. That opens the door for commercial real estate lease agents to get listings if they prospect. Even though commercial real estate lease agents hate to be said "no" to, prospecting will pay off if you do it consistantly. The reason why salespeople hate to prospect is that commercial real estate trainers "try" to teach agents to overcome the fear of rejection but they are going up against human nature. Commercial real estate trainers don't get at the root cause of the problem though. That is because the commercial real estate lease scripts don't include the proper words to use. The goal of commercial real estate is to teach agents what to say to avoid the fear of rejection. 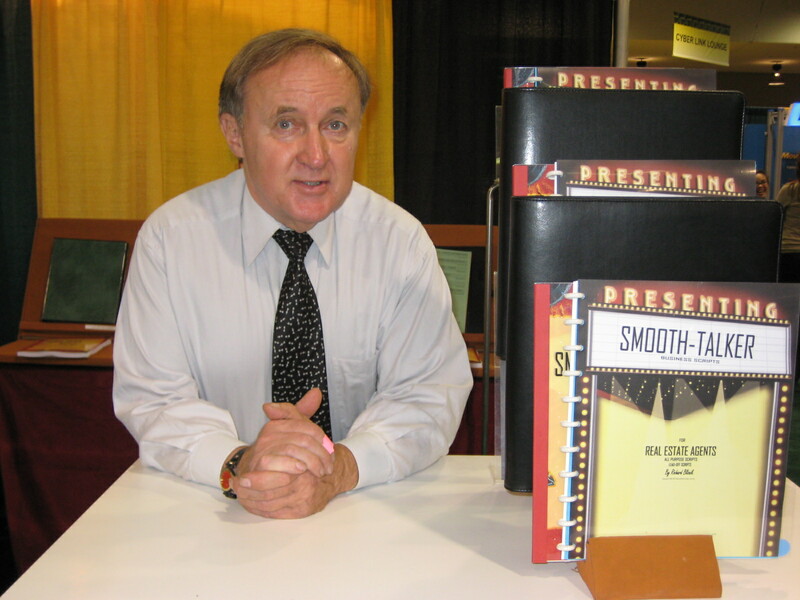 Richard Bliznik is the author of the book: "Smooth-taker, How To Write Your Own Prospecting Script." I wrote a book as a result of 38 years of experience in prospecting and sales. It's a book that has seldom been written before because the people who write most books have never really been on the front lines of prospecting for new business. Their written for easy reading with the words that salespeople can use and understand. 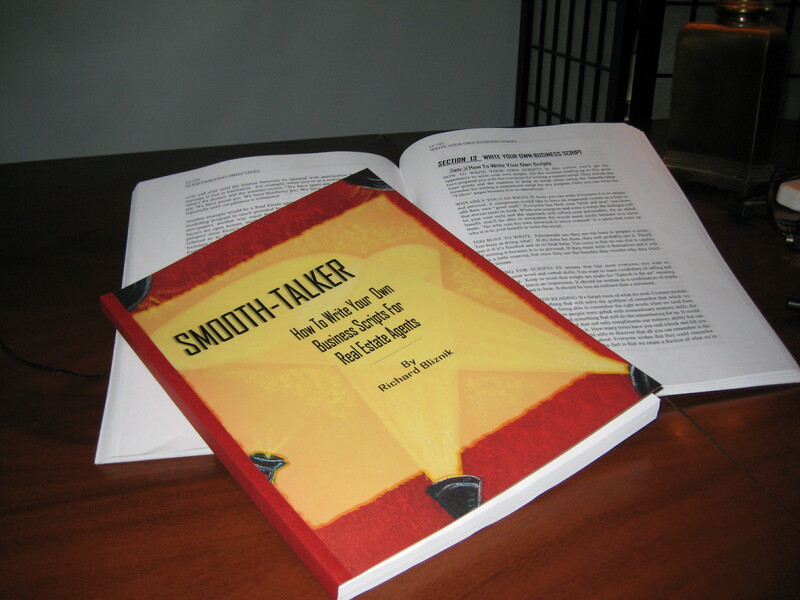 Pictured is Richard Blizniks sales & prospecting book: "Smooth-talker, How To Write Your Own Prospecting Script"
I wrote every single word of the lease scripts for commercial real estate that I publish. I didn't use (steal) other people's version of the dialogue. The scripts were written as a result from making tens of thousands of prospecting calls. After being a real estate broker, sales manager, and trainer for a 60 agent office for over 38 years, I learned that salespeople resisted (hated) make prospecting calls. Not having a written script was to reason because they couldn't remember what to say to a prospect. During my career on the front lines of real estate prospecting, I developed the scripts that I now offer. Pitch scripts are generally obsolete, and they're old and stale. Commercial real estate sales managers claim that salespeople are saying the same things now that they said 20 or 30 years ago. Most sales managers talk about one or two lead-off lines that worked for them. The lines are usually clever and tricky. That's just not practical for the average saleperson. Commercial investment real estate trainers generally teach people what to say from "their" prospective. Prospecting by telephone is different than face-to-face prospecting. Personality, charm, good appearance, and product knowledge are the essential to selling success as long as you are in front of the buyer. Being in face to face has a low probability for rejection. Selling is just a matter of satisfying their need or want for the product. There is little rejection at that point. The advantage is having the prospect at some degree of interest and gives you the implied approval to listen to what you have to say. High-pressure commercial lease scripts don't work anymore. Commercial real estate sales managers write a short script off the top of their head on how get in the door and how to close the sale. It's all based on methods taught to them a when they were commercial real estate lease agents a long time ago. Unfortunately most of what they learned was forgotten. Prospecting for a lease listing is another matter involving specialized word training and verbal skills. Commercial real estate companies provide "pitch" scripts" to their agents. Who determines what leasing scripts to use? Usually it’s the sales manager, but rarely is it someone schooled in the art of script writing. Typically it is someone who knows a lot about selling but not about writing scripts. Management usually chooses the most convincing person to teach the topic. They are not always a good teacher. Companies who are good at developing new lease listings are pushing out those who don't change or learn about lease scripts. Avoiding prospecting for lease renewal may cost a lot of money. Sure it's expensive to operate a sales department but what is the cost if you don't. You must resort to getting business the old fashioned way .. by telephone prospecting. Owners of commercial investment property seldom live on the premises thus the only way to reach them is by phone. Companies concentrate on cutting costs instead of increasing revenues. Oftentimes a commercial investment brokerage seeks to cut costs and it usually comes out of the sales departments budget instead of the advertising budget. In the short-term it may save money and make management look good. Not having the expense of the sales department makes the balance sheet look favorable. It's misleading and it is sure to catch up with the commercial investment leasing department and the company. The following is a list of headings & topics that you are bound to talk about about when making a commercial real estate lease call. GREEN 24 pages total. are the You are talking & conversing, generally asking questions. The dialogue identifies you, gives a reason for the call, and gives a brief selling message. Do you want to lease or property? Prospecting call for leasing. Reasons to lease the property. Follow-upcall, previous contact, stay in touch. Follow-up call after a mailing. Old Lease lead. Let you know a service available. You can lease my property without a listing . I'll give you a one-party lease listing. Calling before or after business hours. Previously contacted - Call to renew interest. Old prospect - Expired listing - renew interest. 12 pages of the traditional questions you need to ask; Need, Want, Money, Time, Potential, etc. Do you need to lease the property? Do You Want The Services Of an Agent? Do you want to get more money for leasing property? Appointment to discuss commission & fees for a lease. The best time to lease the property. Best Time To Meet for an appointment. Potential to lease. - Motivation. Decision To Lease or To Choose an agent. Get agreement to lease & list with me. Close for a lease listing. Overcome reluctance to list the property. Build a relationship & Take the next step. I Don’t Want Whatever You’re Selling. Too Busy - No Time to See You. Why are you calling? Call Me Some Other Time. I’ll Think about It. Send Me Some Information. Tell me over phone. How Much Is Your Commission? Will You Cut Your Commission? Will You Negotiate Your Fees? Others charge less commission. If you’re so good .. then get me my price. I'll Lease It Myself, ... and Save The Commission. My Leases Are Current .. so I'm not interested. I Want to Wait. Now Is Not a Good Time. Wait until the Economy Gets Better. Not Now - Maybe in the Future. I Can’t Decide - Non-Committal. Why Should I Choose You? Why Should I Change Agents. Do You Have a Tenant? You’re Asking A Lot Of Questions. Bad Experience - I’m Mad At You Agents. YELLOW 12 pages of the traditional selling language & reasons to do business. 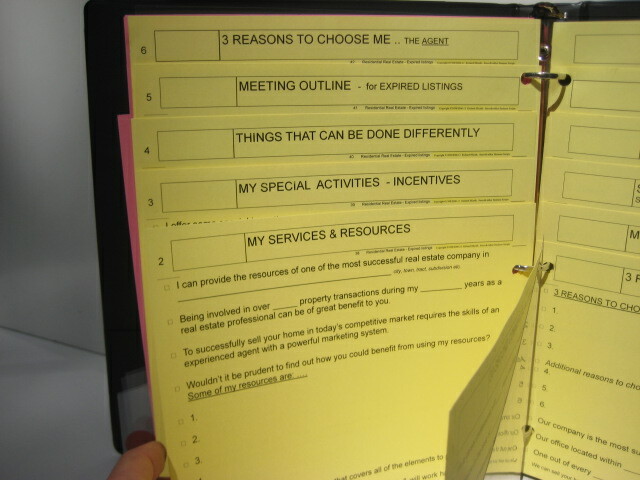 there are blank spaces for you to write in the personal bits of information that will personalize your sales message. Agents "30-Second Commercial" Profile of Agent & Credentials. Why Meet With Me? Things We’ll Discuss. Benefits of my company. My Resources - Company History. What a Broker & Agent Can Do. 3 Reasons to Choose Me. The Marketing Plan I Intend to Use. If you know about an available lease property coming into the marketplace & you don't do anything about it, consider it a lost opportunity and lost market share. You can't make up for lost business prospects. Sooner or later the sales will suffer and business will decline. The company is faced with a loss of market share that is nearly impossible to recover. In the meantime the sales department and marketing department effort’s cost will probably have to be increased by three to four times just to make up for such ill-timed budget cuts. It is a new approach to scripts to lease investment property. Scripts for real estate leases should be a routine activity and it should be a priority. Sadly it is not. Prospecting is usually done sporadically because when a salesperson is out selling, they cannot be prospecting. Procrastination can be very costly. Putting off making prospecting calls for leasing automatically gives your competition a clear shot at the prospect. Competition will always be there looking over your shoulder. It's a constant battle and it won't go away anytime soon. Either you have the talent to write commercial real estate lease scripts or you don't. You have a distinct advantage if your competition is using less effective scripts for leasing to reach new customers. Good intentions at making prospecting calls for getting lease listings are no excuse because your window of opportunity closes very quickly.